Automobile accident injury lawyer Slappey & Sadd, LLC is an Atlanta based personal injury law firm that successfully handles Auto & Truck Accidental Personal Injury Cases and other Personal Injury Cases resulting in wrongful death or severe injuries that may permanently impact your quality of life, income, or long-term health. Slappey & Sadd, LLC is an experienced, high quality law firm. We are careful in deciding which cases to pursue, so we can focus on helping the people who have suffered the most serious harm as a result of clear cases of negligence. To the clients and cases we pursue, we commit the full financial, legal, and emotional resources of our firm. If you’ve been in a car crash, the consequences can be life-altering. An experienced, high quality Atlanta car accident injury or wrongful death lawyer can make a difference in your recovery. If you have suffered a severe personal injury in a wreck with an auto or truck, let Slappey & Sadd, LLC review your case before filing a claim or settling with an insurance company. The insurance company settlement process is established to represent the insurance company’s best interest for any car or truck accident, not yours. Slappey & Sadd, LLC will evaluate your case and answer all of your questions before pursuing a lawsuit on your behalf. If you or a loved one has been injured in a car accident, you need an experienced car accident lawyer to help you get the financial compensation you deserve. We handle our clients’ cases on a contingency fee basis. We will only get paid when we recover for you. Even the best drivers are subject to automobile accidents. Therefore, everyone should know what steps to take immediately following an accident to protect the life, limb, property and legal rights of those involved. Doing the right thing, in the right way, at the right time may save a life, and it will often avoid legal problems. Here are the steps to take if you are involved in an accident with another vehicle or pedestrian. Unless your injuries require otherwise, do not leave the scene of the accident until you have assisted the injured, protected the scene, called the police and assisted them, identified the other driver(s), obtained the names, addresses and statements of all witnesses, made notes and filled out the Accident Information Form and Diagram at the bottom of this page. See your doctor immediately and ask your passengers to do likewise. If another motorist is at fault in an accident, you may make legal claims against him or her for personal injuries, which are generally measured by your medical expenses and lost wages caused by the accident and an amount which may be determined by the jury for pain and suffering under specialized circumstances other types of damages may be recoverable. Claims for vehicle damage are covered by your own collision or comprehensive policy, if you have one. 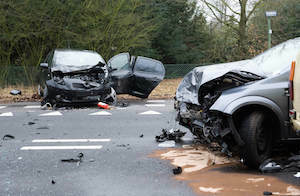 If another motorist is at fault in an accident, you may sue him or her for property damage to your car regardless of whether you can sue him or her for your bodily injury. Driver inattention has long been the cause of car accidents. In the past, this has mainly been associated with falling asleep behind the wheel, eating and drinking and the driver not keeping his or her eyes on the road. More recently the introduction of mobile technology has been implicated in a driver momentarily losing attention such as cell phone use, GPS use and more recently IPads and tablets. Most states have introduced laws to restrict cell phone use at least, but often it is hard for law enforcers to detect and once it is found that a car accident has taken place because the driver has been texting, it’s too late. Driving while drinking or taking drugs is illegal in all states in the U.S. but this doesn’t stop people stepping into their cars when they have drunk too much and losing control of their vehicles causing devastating accidents. Despite road signs indicating the safe driving speed for an area, some drivers take advantage and either speed because they are in a hurry or because they enjoy doing so. This sort of recklessness can have the most serious outcome as anyone who is sharing the road with a speeding driver who loses control the impact can cause serious damage to both the vehicles and life threatening injuries or fatalities to any drivers or passengers involved. Stopping at a red light or stop sign at an intersection is obligatory and anyone who is caught taking part in this act will be handed out a citation but this may be when it is too late and people have either been killed or seriously injured as a result of someone else’s action. Reckless drivers are some of the most dangerous on the road as they get into their cars with little or no intention of following driving rules. They take risks and avoid traffic signs without thinking what damage they could inflict. There are serious consequences if a reckless driver is stopped by a police officer such as driving license suspension, heavy fines and even prison terms but this doesn’t stop them and they cause fatalities and injuries on the roads every day. One of the commonest injuries in a car accident is whiplash when an inattentive driver fails to stop when coming up behind another car and the occupants, taken by surprise, fail to brace themselves for the impact. Apart from this back, spine, neck and torso injuries are common too as well as broken bones and traumatic brain injuries. Severe burning can occur if the car explodes on impact. All these injuries can affect the victim both personally and financially and may remain for the rest of the victim’s life. Fortunately, virtually all states in the U.S. have some protection for victims of car accidents that were not their fault. Car accident victims may be able to file a compensation claim against the driver who caused the injury if negligence can be proven. If you have been injured in a car accident it is important to contact a personal injury attorney who will pursue a claim on your behalf to cover you for hospital costs, loss of wages and even pain and suffering. You normally don’t need to worry about upfront fees as most attorneys work on a contingency fee basis, meaning the legal fees are paid on settlement. In most states a statute of limitations applies which is normally 2 or 3 years after the injury has taken place. This means that the claim must be filed within that period to have any validity.